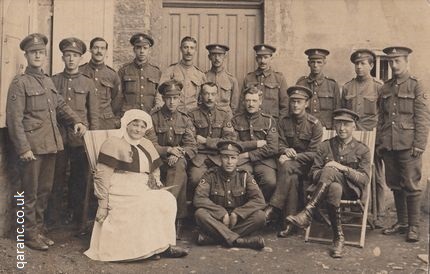 Timothy McCracken has compiled a fantastic collection of photographs from World War one which not only contains hundreds of RAMC photos, but as you can see from the images further below, many Queen Alexandra's Imperial Military Nursing Service pictures. 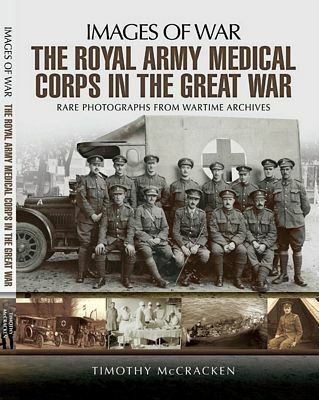 The Royal Army Medical Corps in the Great War (Images of War) book guides the reader expertly through the years of WWI from the call up of units or their formations, their journey to theatres of war and then the work of the RAMC and QAIMNS. This includes the challenges of the chain of evacuation and the types of transportation available. Rare images of horse and carts, the first motor ambulances, hospital trains and stretcher bearers are some of the many gems contained in this fascinating volume. Other gems are the images of patients with their field medical card being attached by a battle-weary medic. 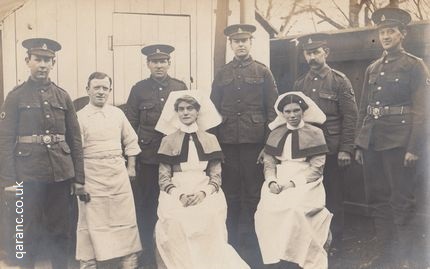 QAIMNS Reserve Nursing Sister and Staff Nurse with RAMC personnel. Note that the Sister (on the left) wears a Princess Christian's Army Nursing Service Reserve Badge. I like that there is a balance, rarely seen in some military books. So along with the British images, there is a real International mixture ranging from French army medics, American voluntary nurses in American Ambulance Hospital, through to German Military Reserve Hospital patients and nurses. Timothy starts each chapter with a history of his subject before revealing the images he carefully curated from many sources, such as local newspaper archives, The London Gazette, unit war diaries, personal collections from families and more. 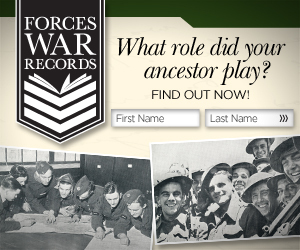 Each has accompanying text describing details that guide the reader through the war years. For instance, I learned that there was a black mourning button worn by soldiers. Other uniform items explained throughout the book include the wound stripes, Imperial Service Badge and oversees service chevrons. We also see the challenges of harsh French winters revealed in the medical orderlies and stretcher bearers who wear goatskin tunics alongside their small box respirators. The varied RAMC uniforms are explained, such as the Kitchener's Blue Uniform. 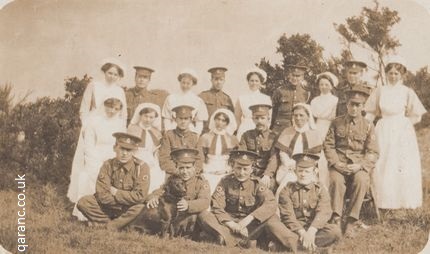 Queen Alexandra's Imperial Military Nursing Service (Reserve) nurses and RAMC personnel at Walmersley, Greater Manchester. Readers learn of buildings used as hospitals such as St Mark's College in Chelsea. They also learn of units as varied as the 2nd London General Hospital through to a Sanitary Company near the frontline. I love that as I turned one page there was a suddenly unexpected photo of medics having a snowball fight. The Christmas theme is strong in the book and continues with a copy of the Christmas card from Queen Mary's Military Hospital Whalley, Lancashire, which was a 2000 bed hospital. Other photos of home front buildings used to treat returning casualties include Lewisham Military Hospital. Given that many patients would receive long-term care, some set up, or contributed to magazines. Examples of covers and contents include The Gazette of the 3rd London General Hospital in Wandsworth. Many of the unit photographs on the Western Front have dogs as mascots, but we like this of the QA holding a bird. All the photographs are so revealing and give a great insight into the contrasts of struggles and strains and then glimpses of happiness of service life for the RAMC and QAs. I would thoroughly recommend Timothy's excellent book to anyone with an interest in the Great War or of the history of the medical corps or the nursing service. It is available directly from the publisher Pen & Sword Books or from Amazon . Timothy McCracken has also writtern Dumfriesshire in the Great War.